Love them or hate them, profile photos are now a way of life. 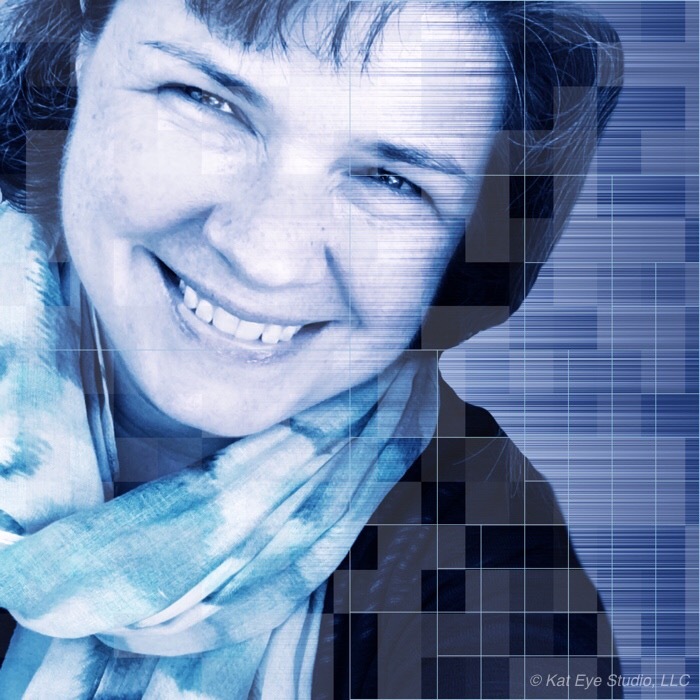 You can hardly navigate the online world without having an avatar that shows who you are. And why would you want to? Sharing a photo of yourself as you participate online inspires trust and establishes you as a real human, ready to be yourself in both the real and online worlds. 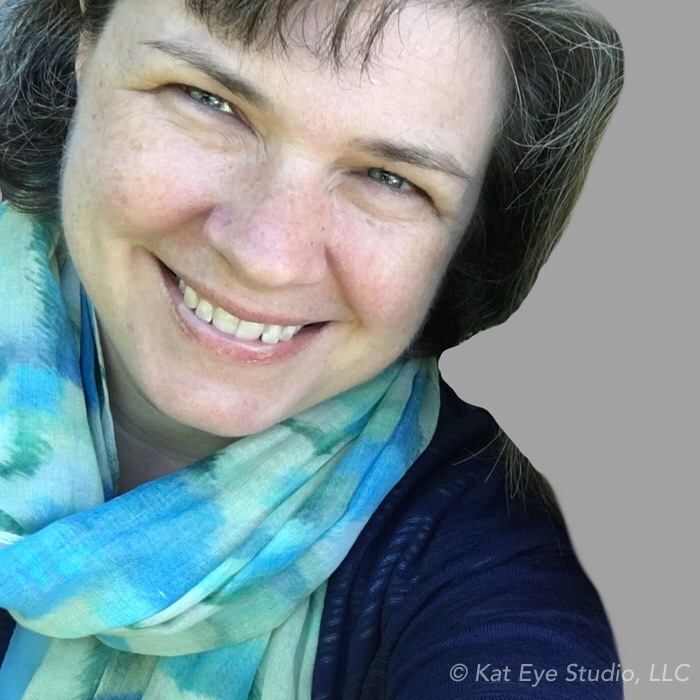 If you do it right, a profile photo can be an extension of your personality. A good one can be your own personal logo, making you instantly recognizable online. So let’s make a good one, shall we? This week I’m sharing Part 2 of the Creating an Interesting Profile Photo tutorial, which steps you through the process I used to create my and my son’s new profile photos, shown below. We pick up where Part 1 left off, so visit that part first to see where these images started. I wanted to add some geometric effects to the profile photos, and adding effects to a full color photo can be hit or miss. It is very easy to create visual mess with lots of color and lots of shapes, so going to a simpler color palette allows you more complexity in effects later. I started the color alterations on Brandon’s by going black and white in an earlier step. In iColorama, I exaggerated the black and white, giving it a more graphic feel by increasing contrast and grain using an effect found under the Style > Hatch menu. From there I altered the color using a preset under the Tone > Tint menu. Explore the blending mode options when using this menu. Screen blending mode worked best to tone the black and white in this case. For my profile photo, I started with the color version and went straight into the Tone > Dutone menu. In this case, I didn’t change the Blend Mode but I did change the Opacity setting to 80%, letting a little bit of the original color come through so it was not a flat blue. In many iColorama menus there are a range of adjustment options like Blend Modes and Opacity. Experiment with these to get a custom look for your image. Now I’m ready for the fun part, adding effects! iColorama has a great range of geometric effects, which is what I wanted here to represent the “techie-ness” of my son, and myself too. That geeky engineering background needs to come through! You will want to choose your own effects based on your personality. Do you want to go painterly and soft? Are natural fibers and textures more your thing? Think about what you like to wear, the art you choose, the colors you gravitate to. 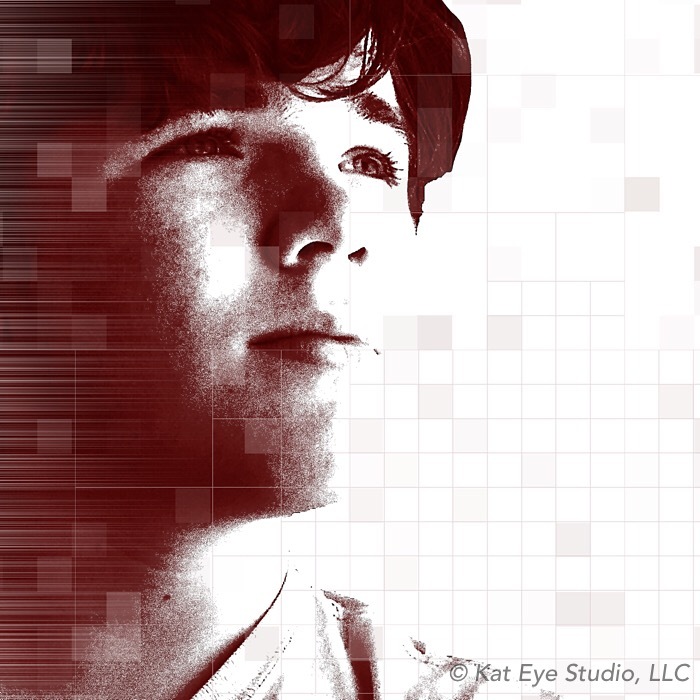 It’s not only the photo, but the application of color and effects that make the profile photo represent you. So… Geometric effects for me and Brandon. This is where I’m going to go into more detail, and share a great feature in iColorama: The Swatch. All of the effects I used in these images are found under the Preset menu, either Grids or Shift. 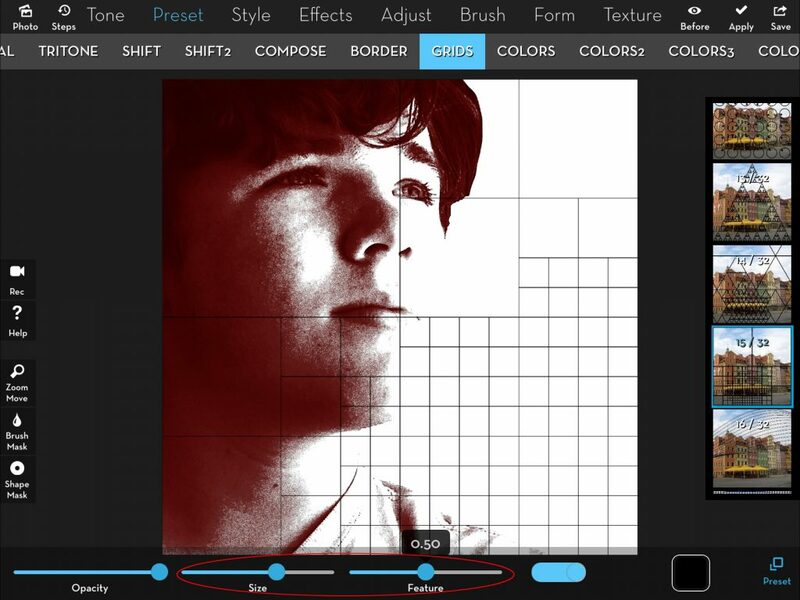 In Grids, you have a number of preset grid options you can overlay onto your image. When you first try out the Grid presets, you may notice the grid is a distracting black and it may cover important parts of the photo… Like your eyes and face. But there is a great range of adjustability in these Grids. Start with with Size and Feature sliders at the bottom to see what they do. In this case. The grid flips around to be where I want it – away from Brandon’s face – just by adjusting these sliders. Once you have a grid where you want it, it’s time to change the color. Tap the Grid Color icon at the bottom of the screen, and another menu comes up to change the color. Tap “Swatch” in that menu to get to the color swatch. 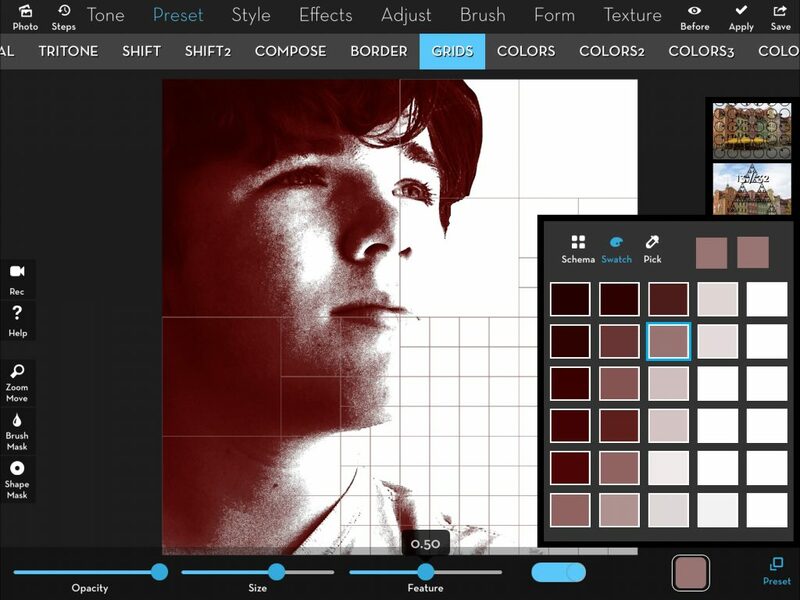 This is the awesome feature… It creates a color swatch from the colors in your image, so you can match the color of the grid to the colors in your image. 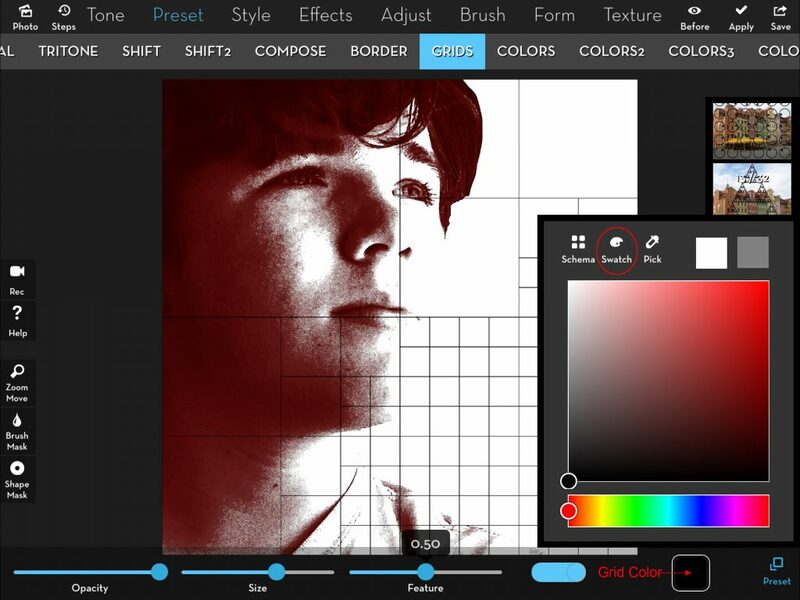 Now you can tap the different options to change the color of the grid and see what looks best with your photo. It makes a big difference to change from the basic black of the preset options to a color from the swatch. Look for the Swatch menu anywhere you see the Color icon. It may not be available in all menus and presets, but it’s worth it to check. After adding the geometric effects, the images were almost done. Just a few finishing touches to close things off! For me, I had a couple of things to do. First, I didn’t like the brighter spot of my hair in the upper left corner or the fact the pixels did not end neatly on the edge of the screen on the right side. So I took care of that with a crop in Snapseed. Second, I didn’t like how my lips looked chapped. Anyone who is around me for even a short length of time knows I’m obsessive about applying Chapstick, so how did that happen? The roughness seemed to be highlighted by the color conversion, and I thought it was a distraction. (Not to mention, once I noticed it, I needed to apply Chapstick every time I saw the photo because it looked so uncomfortable! See? Obsessive.) So I used Retouch in Handy Photo and cleaned things up to even out the bright spots. Voila! Finished photo… You will now see it everywhere on my social media streams. Fun! So what do you think? 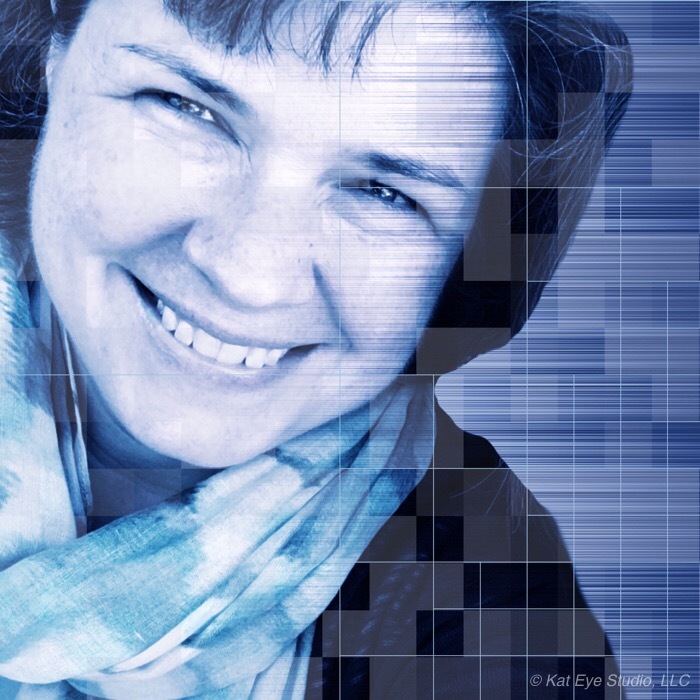 Are you ready to try creating a more interesting profile photo for yourself? What colors and effects will you choose to represent your personality? 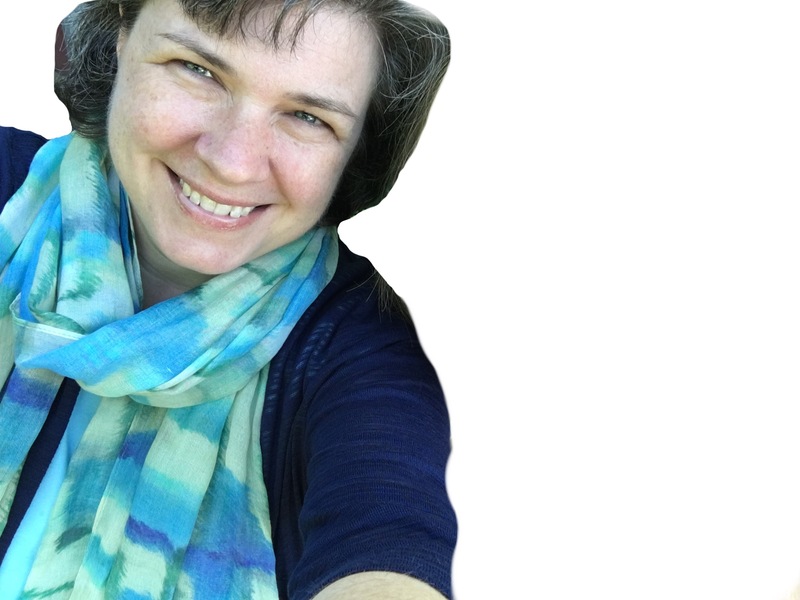 It’s your turn to create a profile photo that shows the true you! And for one lucky person, I will create a profile photo for you! Just leave a comment with what colors and effects would represent you this week, and I’ll randomly select one of the commenters to win. I’ll contact the winner via the email to get a starting photo. Should be fun! In early 2000, I started to get serious about learning photography. I got my first SLR (film!) and started playing around, taking classes and exploring my world with camera in hand. In 2001, my son arrived and gave more purpose to my photography. He was my primary subject, and experimenting with photographing him is a big part of my early development. Until one day, when he was 6 or 7 years old, he said, “Mom, stop taking pictures of me!” To be honest, he hadn’t been a willing subject for a while, I was always bribing with cookies and other treats. But him voicing it so clearly meant I had to change. My days as the mammarazzi were over. Even now that he’s a teenager he’s not very interested in being photographed. We’ve had fights about it. 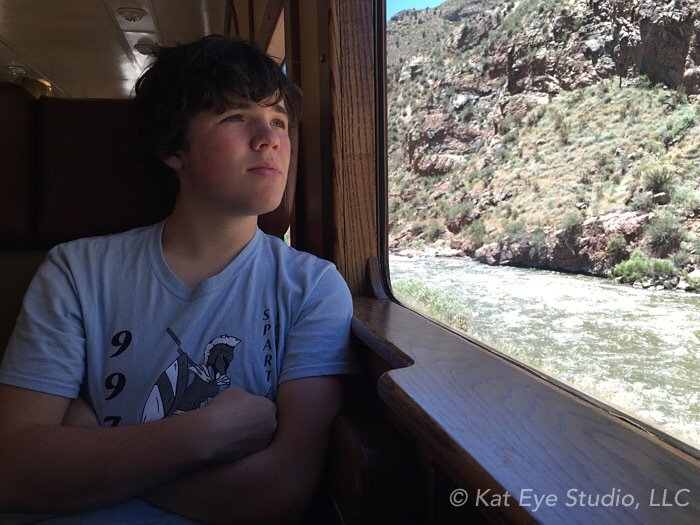 So when we were on vacation and I asked if he would let me take photographs of him looking out a train window, I was shocked to hear agreement. “I need a new profile photo,” he explained. So we took a few shots and he was done, off being silly with his cousin. 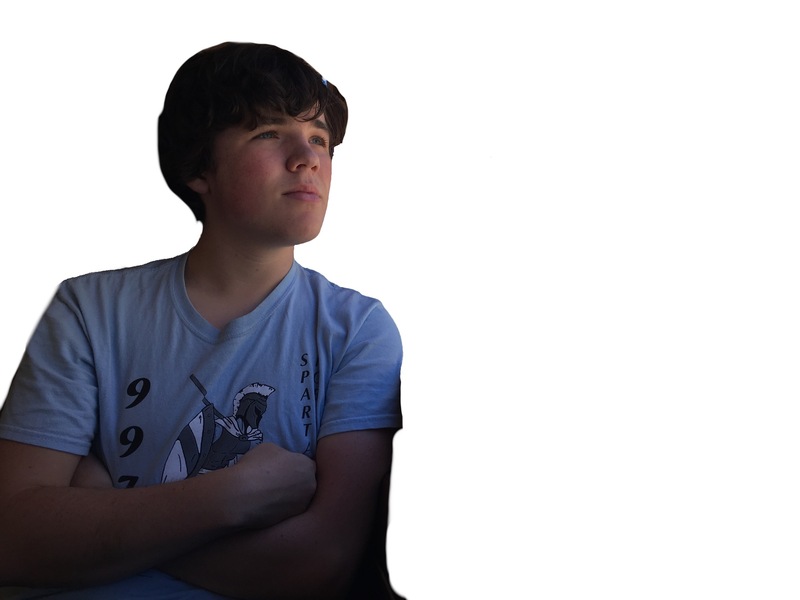 I got not only the joy of a willing subject in my son for a few minutes, but the fun of creating an interesting profile photo for him too. I liked it so much, I created a similar one for myself! 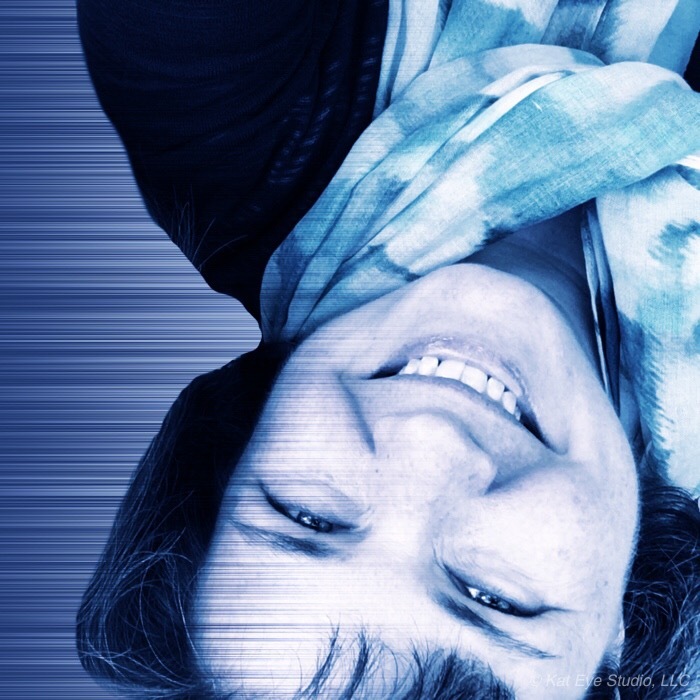 So I thought, why not share with you the steps to create an interesting profile photo for yourself? We use these images everywhere — Email, Facebook, Instragram, you name it — so they might as well be something you like. This tutorial will be in two parts, outlining the general steps and diving in on a deeper tutorial for one aspect in each part. For my son, I have a series of photos of him looking out train windows, from the time he was about a year old. This overall photo is ok, could be better with some processing and a crop (and without that busy t-shirt), but I liked the light and expression on his face so that’s what I chose to use. 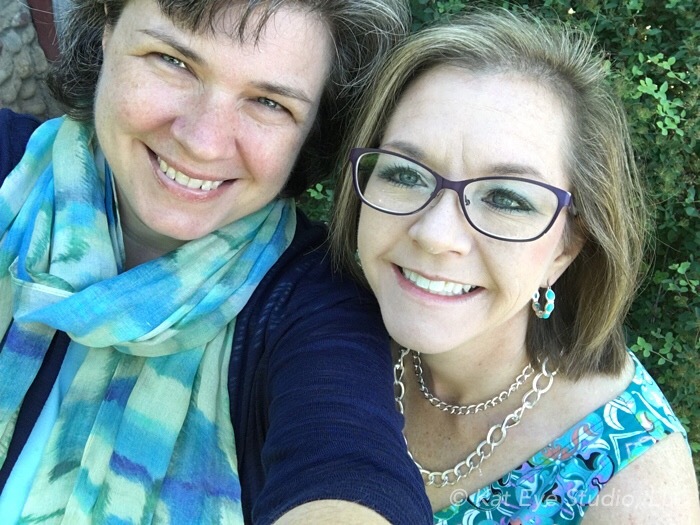 For mine, this selfie of me and my sister turned out great, but I needed to remove her (sorry sis!). Whatever the method, you are working to cleanly extract the subject from the surroundings. One note: If you have a subject with curly hair (like me and Brandon), you will just have to smooth it out in the masking. It’s nearly impossible to cleanly separate from a busy background. You don’t have to be perfect with the edges, you can certainly see imperfections with these. We can address most of those in how we layer and adjust on the background, in the next step. Now that we have our subject cut out, we need to layer on a neutral, square background in the desired composition. Why square? Because most profile photos are a square or a circle, so if we create a square image it can be used everywhere. 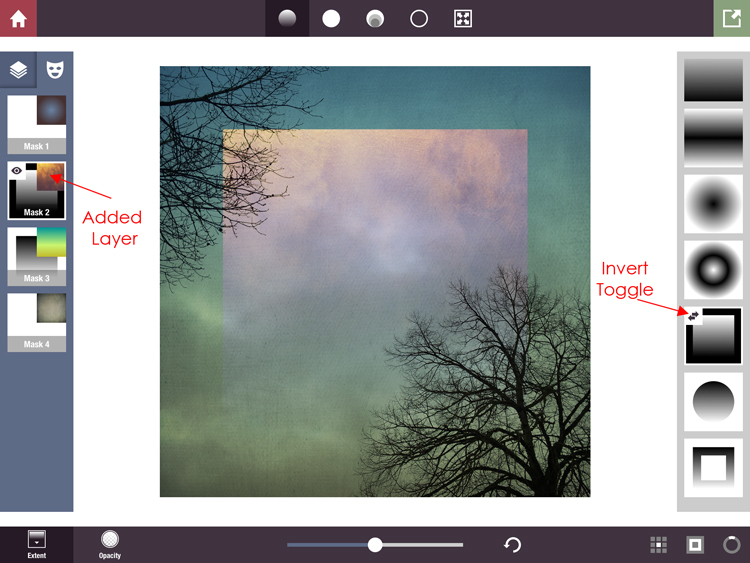 I do this layering in Image Blender, using the Arrange function (tutorial in Art with an iPhone). For a profile photo, you want it to be mostly face, so zoom way in. If the image ends up a little blurry because it’s so zoomed in, don’t worry. This is going to be a creative profile photo! It doesn’t have to be perfect. 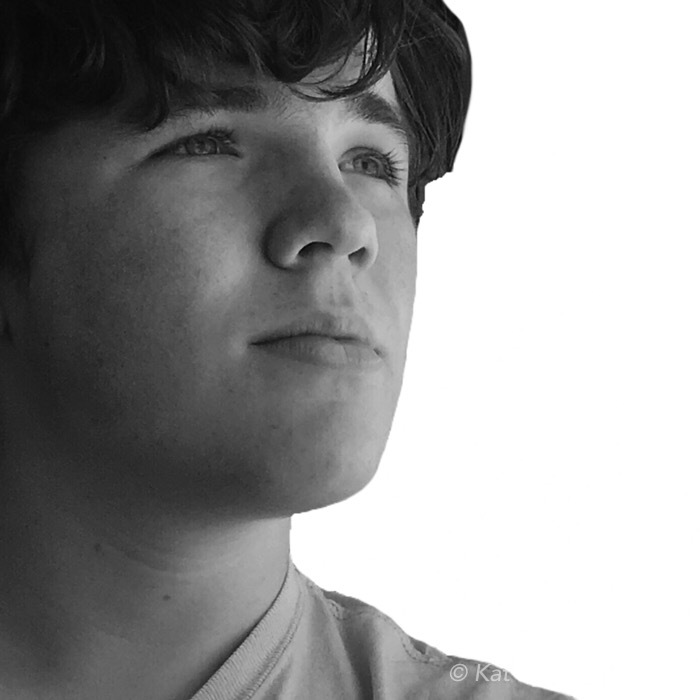 For Brandon’s, I had converted the masked image to black and white before composing on the white background. You might not be able to see it, but there is a white background behind him. For mine, I started with a white background as well, but realized as I started playing in the next steps that was too stark for what I wanted to do, so I experimented with layering on black and grey. The grey worked best. 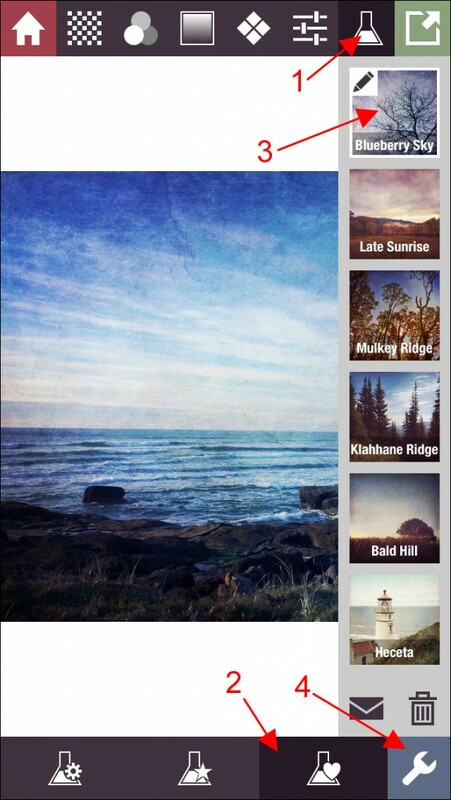 To create all three backgrounds, you will need the ProCamera, Image Blender and Big Photo apps. If you don’t know how to use these apps, they are all explained in my book, Art with an iPhone, so check that out. First you start by taking a white photo in ProCamera. That is not as easy as it sounds, because on automatic exposure settings, all cameras want to expose to a mid-tone grey. 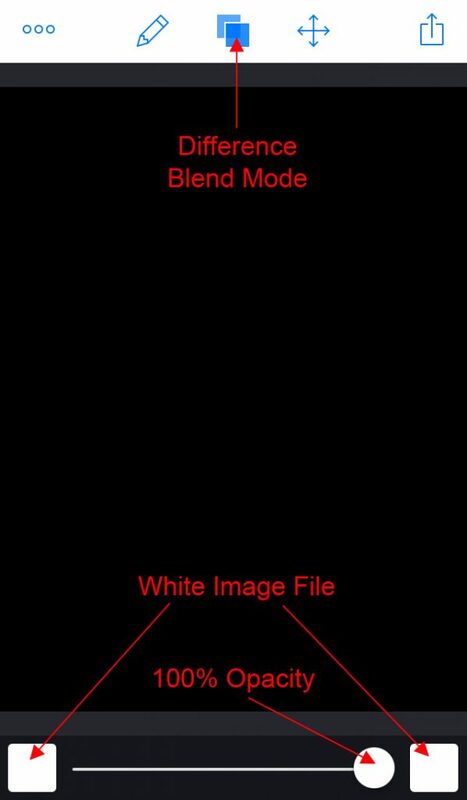 That means when you try to take a photo of something white, like a piece of paper, you get something darker than white as seen in the next screen shot. You have to manually tell the camera to overexpose the image. In ProCamera, you do that with exposure compensation. Tap the exposure compensation icon indicated above, and pull the dial that appears on the bottom of the image all the way to the left, for maximum overexposure. You can see in the screen shot that the image on the screen is now full white. 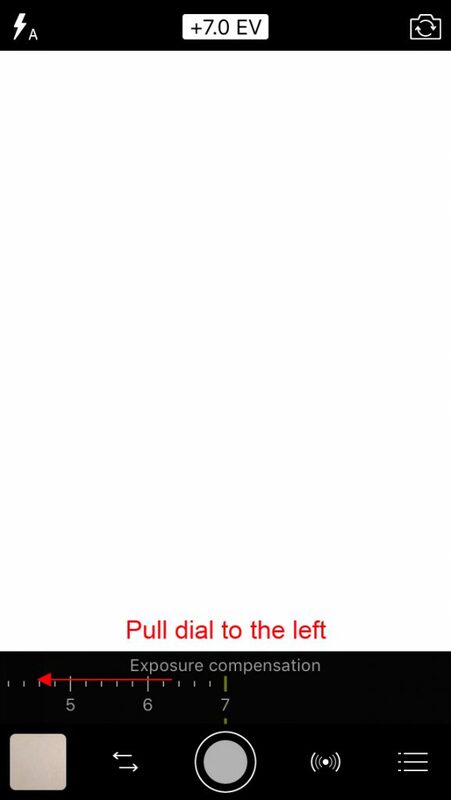 Take the photo, and you will have a fully white background on your camera roll. Let’s not stop there, let’s create the grey and black backgrounds too. You do that using Image Blender. 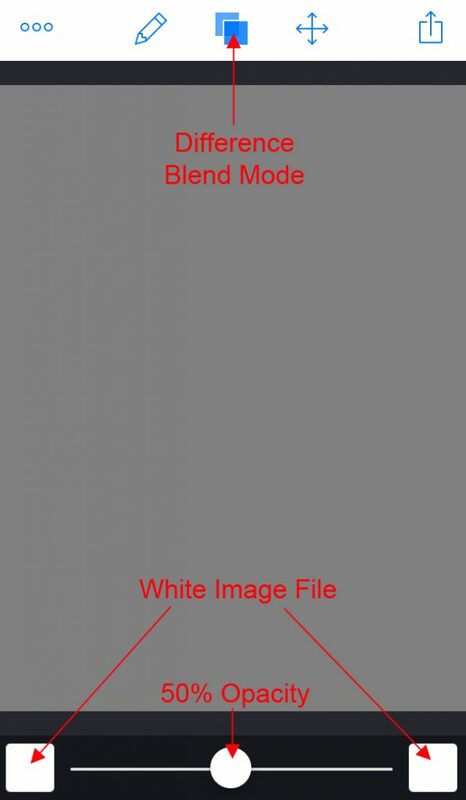 Load the white photo you created as both the bottom and top layers, and then select Difference blending mode. At 50% opacity, you will have a grey image. Save it. At 100% opacity, you will have a black image. Save it. 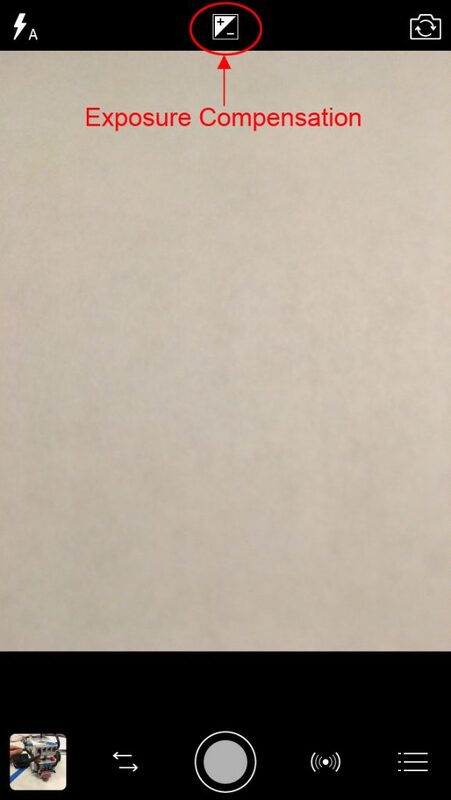 Now you have solid white, grey and black background images on your camera roll. Awesome. The last step is to increase resolution of these images in Big Photo, so in later blending you end up with a high resolution file. Tag these high res images as “Favorites” or add them to a “Backgrounds” album for easy access. You can crop them to square and have square versions at the ready too. I use these all the time! Next week I’ll get into the creative processing steps for altering color and adding effects, and show you a really cool feature in iColorama. Stay tuned! 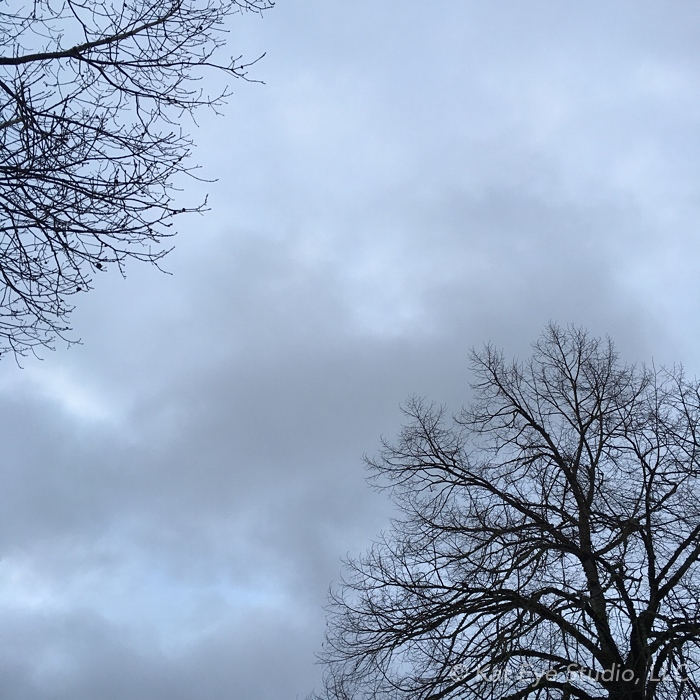 I’m already learning from my #30edits Abstract Challenge! Just what I was hoping would happen. And that, of course, means I have new things to share. 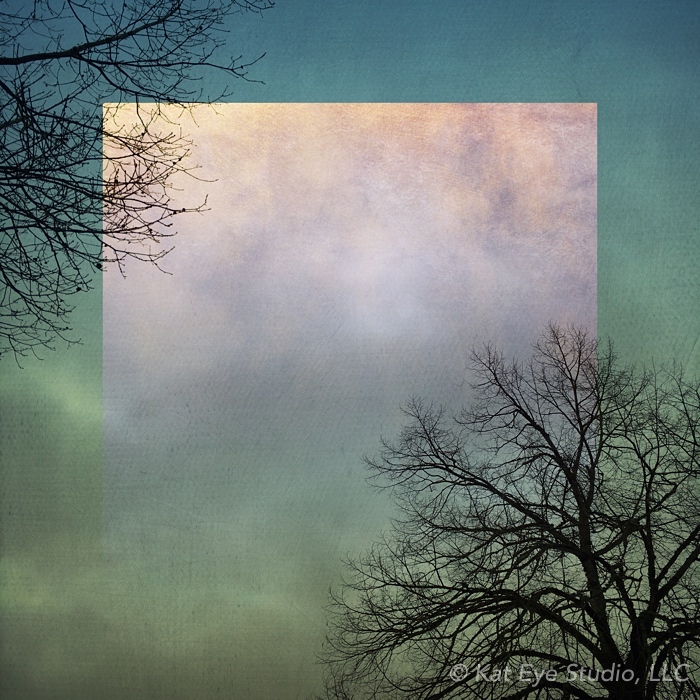 One of my early observations: The first step in any abstract edit is removing the connection to reality in the image. Turns out, that is harder to do than I realized! Our brains seem to want to make meaning out of the slightest texture and pattern, so removing that connection to reality requires some work. One way to do this is through blur of the image, which softens the lines and textures which provide a lot of information to our brain. Today I’m sharing my favorite method for creating background blur using the Stackables app, using an image I shared last week in another post. 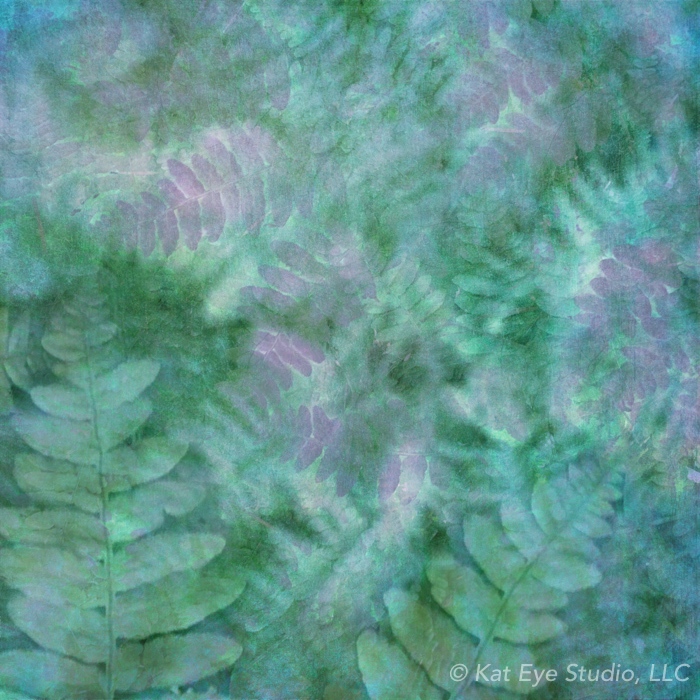 I think this forest fern image was leading me toward my abstract project. 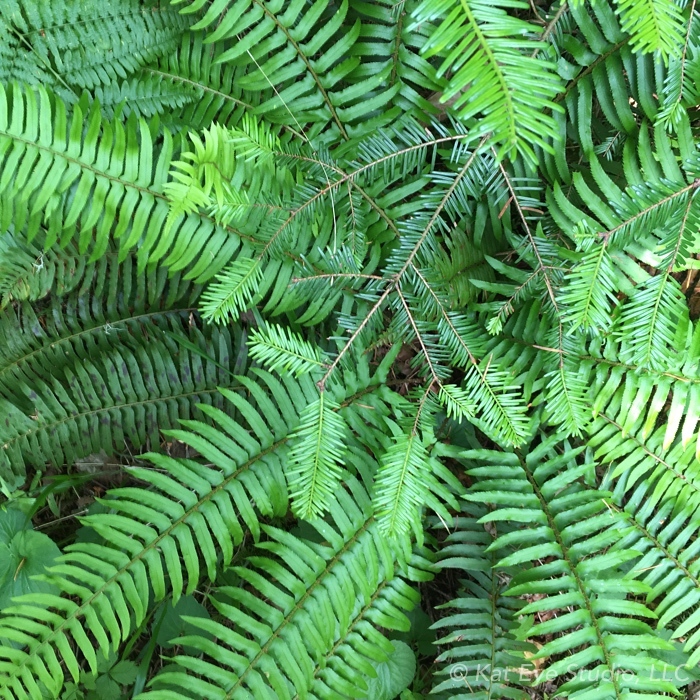 I started with this forest image, which caught me eye due to the interesting repetition in the ferns and fir needles. In Stackables, you can add a blur layer by going to the Adjustments menu (top bar) and selecting the Blur effect (right menu). You can increase the blur by selecting Intensity (lower left), and then increasing the slider (bottom bar). 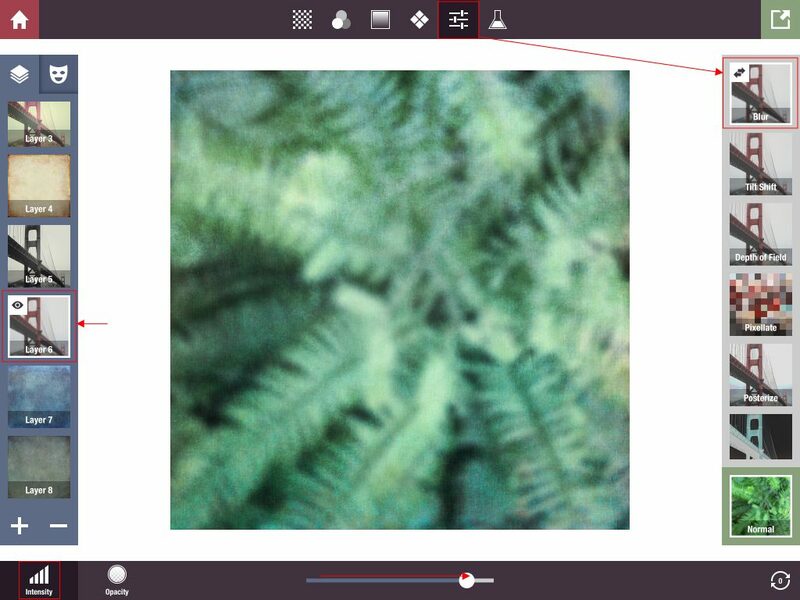 Layer 6 in this iPad screen shot is the blur layer in the Stackables formula I’m sharing with you today. If you want to increase blur more than possible with a single layer, no problem. Just duplicate the layer. You can keep adding Blur layers to reach the desired effect. Increasing blur increases abstraction, by taking away the edges and textures of the object you photographed. The final image (here again) was created by blending the blurred background with some other fern images. 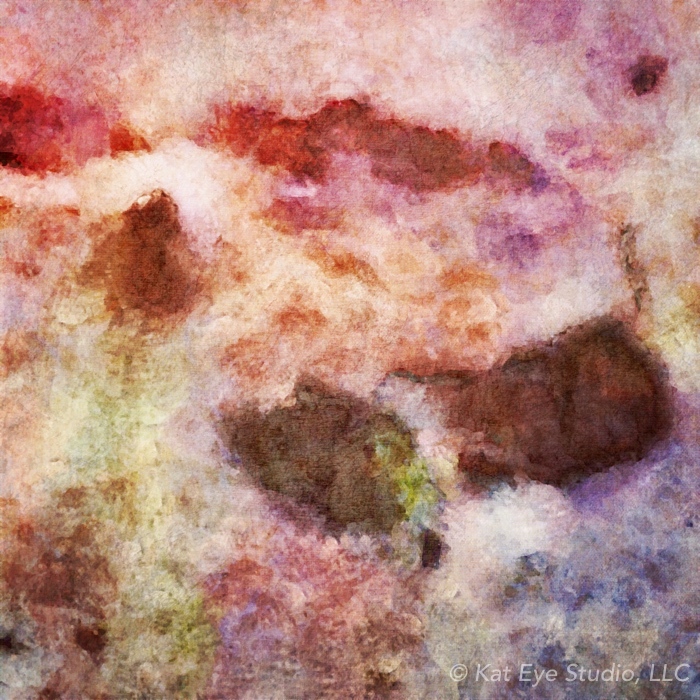 It is not a full abstract, but you might be able to see how the original image comes through as a background layer. Now I have the Stackables Formula for you! This formula, called Bluish Blur, was used to create the fern background above. 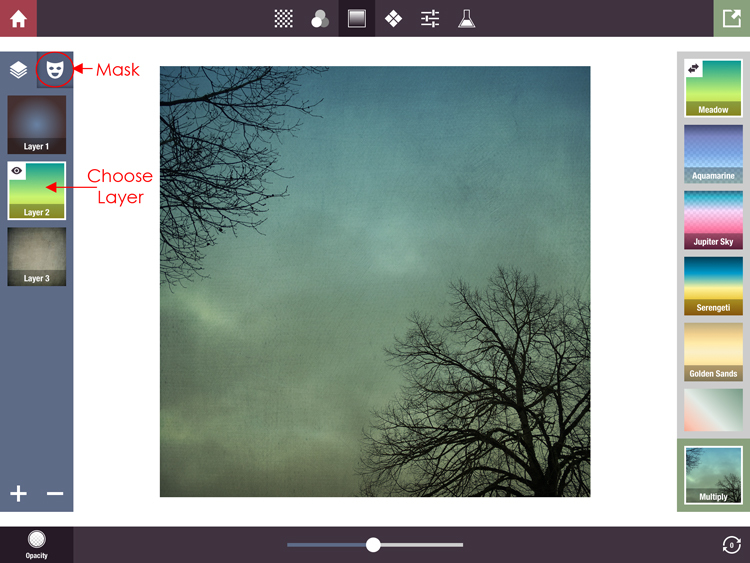 It shows you how you can use blur along with other Stackables layers to begin changing an image toward abstract. Have fun abstracting! Part of living a creative life is exploring new techniques and learning new tools. I’ve been doing more and more with an app called iColorama, an amazingly featured and versatile artistic app. This tutorial on how I created “Castles on the Sand” will give you an example of a few features you will find inside this app. 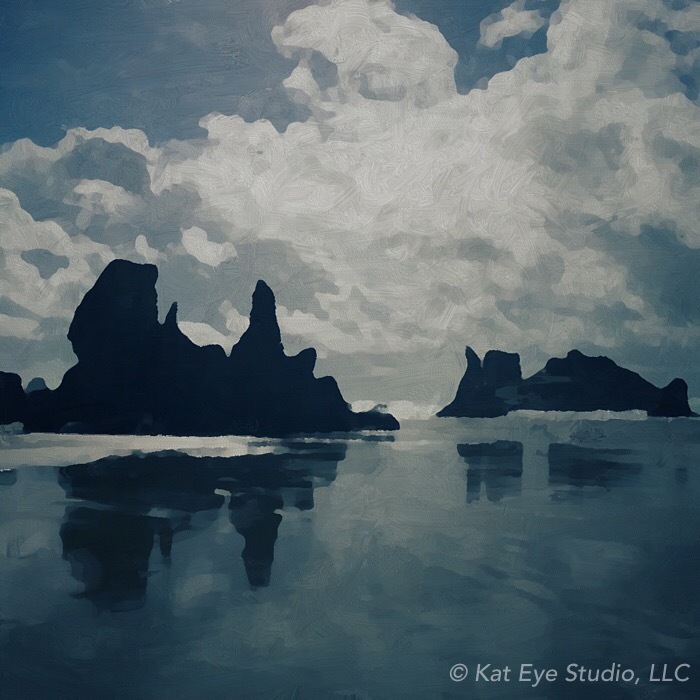 The image starts with a walk on the beach in Bandon. Our spring break trip was quite rainy, but we had some clear patches each day for a walk on this amazing beach. The tide was going out so the wet sand was perfect for reflections, and a storm was blowing in so there was this amazing light and sky. My starting image is not perfect. It’s not even on focus! I’m not sure if I just missed getting the focus right (I can’t tell unless I have my reading glasses on, which I didn’t), or if it was blowing so hard I couldn’t hold the camera still (I do remember wind), but either way it’s out of focus. 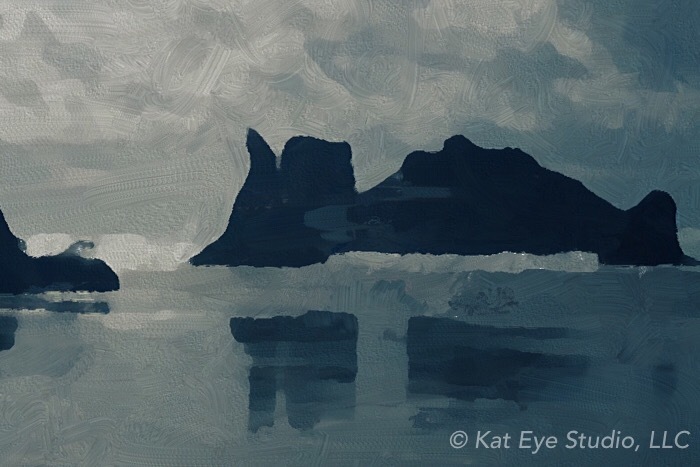 But the shapes, light, and reflections are perfect, so I thought…I’ll try a painterly look! The first step of the edit was in Snapseed, to change the color tones to a more monochromatic look using a Vintage filter without the vignette. As much as I like iColorama for a lot of things, the color filters are not my favorite. I’ll usually start in Snapseed, Mextures or Stackables if I want to change the color tones. Isn’t this a nice blue? Next into iColorama. Since I’m going for a painterly look, I start with the Painterly filters, found in Style on the main menu. The way iColorama works, the main menu is always at the top. After you select a main menu, a submenu appears below it to scroll through, left to right. Look for available Presets in the bottom right, which will pop up effect options you can scroll through (top to bottom) if there are any available. In the bottom left, you will find an Opacity slider which allows you to reduce opacity and blend with the previous image if you want to reduce the intensity of a given effect. This screen shot is from the iPad, which gives you a lot more room for all of these menus and options. The menus can be found in the same relative location on the screen with the iPhone version, but you don’t see as many options at a time and they will overlap the image. To close a pop up menu, like the Preset options on the right, just tap the Preset icon again. You can tell which menus and options are on at any given moment by the blue text and highlighting. I liked the simplified edges of the Painterly 3 filter at 100% Opacity, shown here. That was a good start, but I wanted more variation in the feel of the painted look so I decided to “paint” it myself, which you can do from the Brush menu. Unlike many painterly effects in apps which apply an effect to the whole image, in the iColorama Brush menu you actually get to paint! 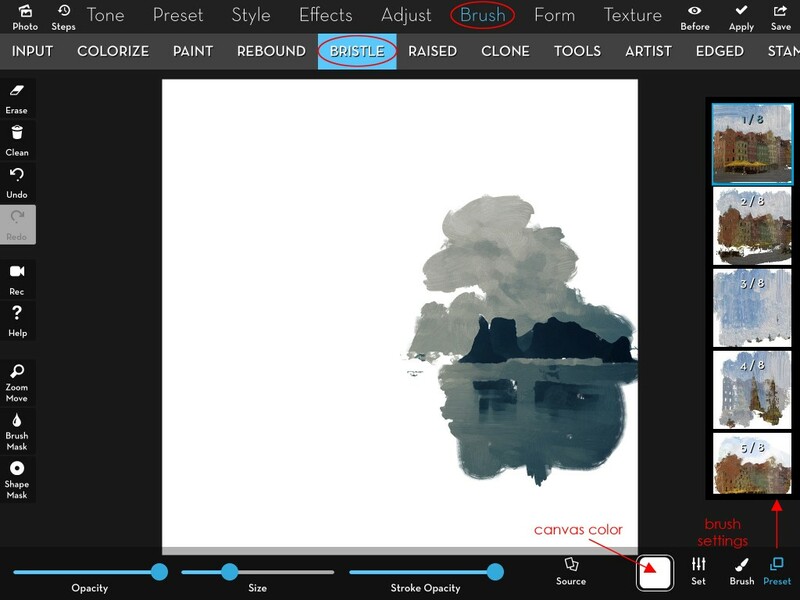 Choose a type of Brush, I chose Bristle here, and then look at your options. 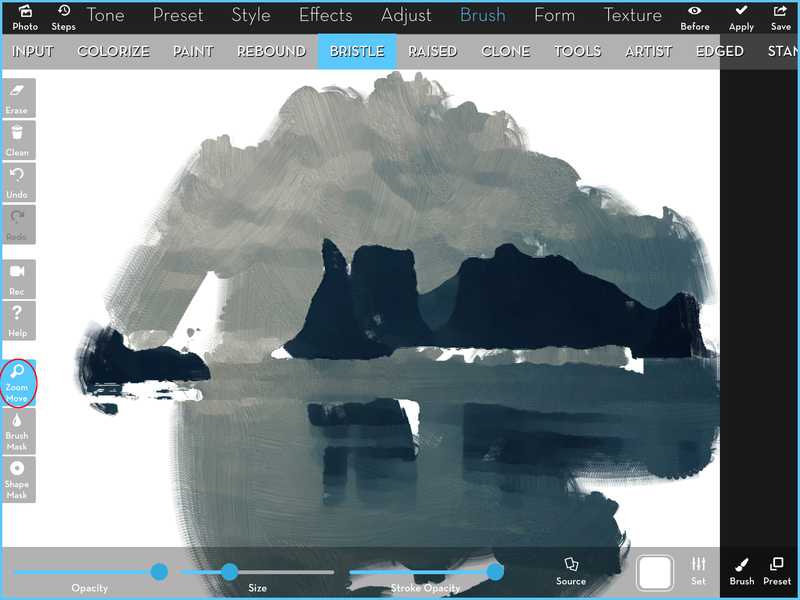 There are different Presets, which in his case determine how much you smear color from one area to another, different brush shapes and other settings. You can change the color of your background canvas from white as well. Along with the usual Opacity slider on the left, you can also change size and stroke opacity for your brush. There are so many options it can be overwhelming, so to get started stick with the defaults and play around. You know me, I’m all about learning from experimentation! A finished product doesn’t have to come out at the end. As you get into this type of detailed brush work, you are going to want to zoom and pan to see exactly what is going on with your brushstrokes. You do that my tapping the Zoom Move option on the left of the window. When this option is highlighted, you can zoom in and out using two fingers and pan the image using one. When you are ready to brush again, just tap to turn off the Zoom Move menu. You’ll also note on the left that you have a few undo options. Undo will remove the last stroke (unfortunately it doesn’t have a longer memory than the last stroke! ), Erase will allow you to erase an area back to blank canvas, and Clean will revert the whole image back to blank canvas. Don’t you love digital painting? Can’t do any of that with real paint and canvas! I played with a couple of options on this image. My first one left a bit of blank canvas in places, shown here. I thought those bits of white were distracting even though I liked the variation they added, so in the end, I painted the whole image. I still added variation through the stroke texture and color blending that happens in the painting process. You can see that better in an enlarged view. You are going to see me using this app more and more. I’ve had it forever and recommend it in my book, Art with an iPhone, but didn’t start using it regularly until #30edits pushed me out of my comfort zone. I’ve barely scratched the surface of what it can do. As I continue to learn, I will share with you. I’d love to see what you do with it! With my recent #30edits challenge, I pushed into new territory, deeply exploring the features and effects in my go-to apps. One of my favorite discoveries is the masking feature in Stackables. Today I’m going to explain how I used this feature to create a recent piece, Gatekeeper. If you haven’t used the Stackables app before, you can get the basic instructions in this earlier blog post. 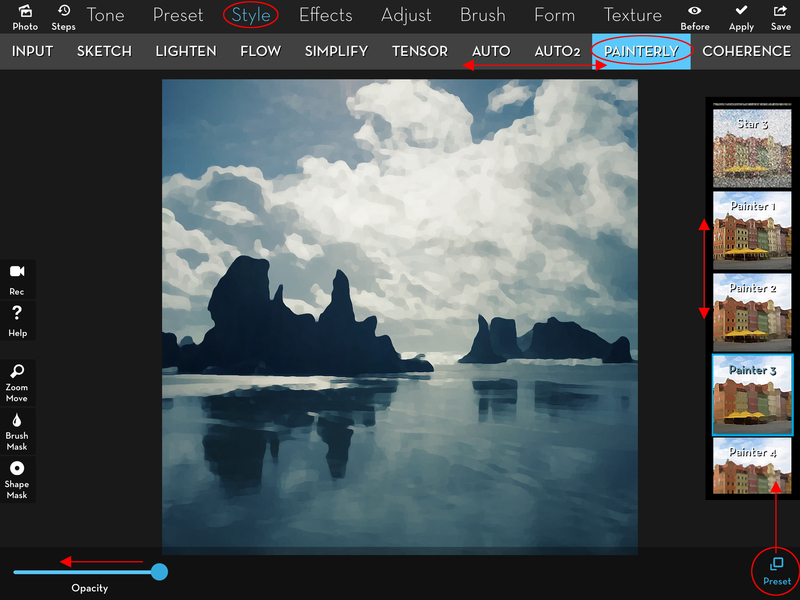 I’ve also posted many Stackables Formulas in the past, which allow you to use the same layers and settings I used to create an artistic effect. Take a look at those posts for more background. Today we are going to specifically dive in on masking. 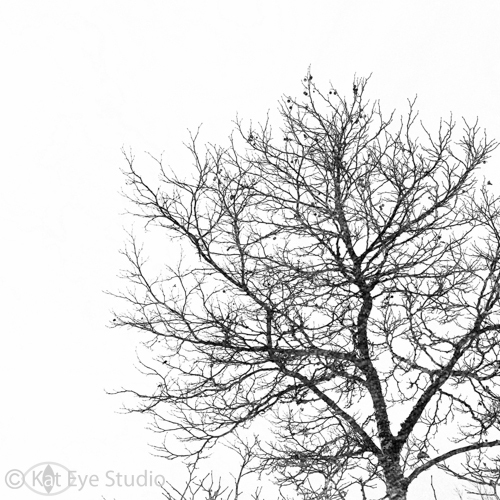 Starting with this lovely Oregon winter tree photograph, I’m going to experiment in Stackables. This opens a whole new menu of options! There are different mask menu options on the top of the screen, masks to choose from the menu on the right, placement options in the lower right corner and extent/opacity selection in the lower left corner. 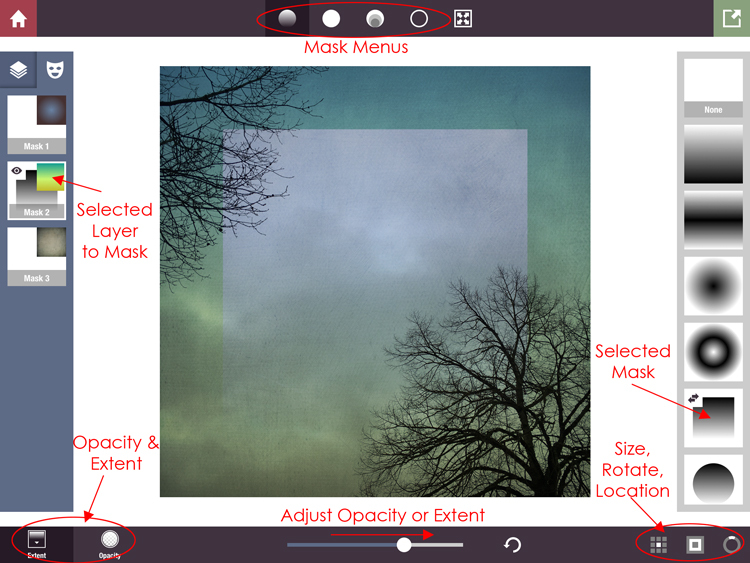 In this menu, I can choose a mask for the selected layer by tapping on one of the options in the menu on the right. The way the mask works, the black pixels block the selected layer from showing through. You can see that in the image; the green/yellow gradient layer is blocked by the mask. To allow more or less of the layer to show, you use the opacity and extent sliders. You can also adjust the placement location, angle of rotation and size of the mask by using two fingers on the image and moving the mask around. Alternatively, you can use the preset positioning options in the lower corner. If you are going to mask multiple layers, I recommend you use the presets so all of the masks line up. I’ve opted for the default position in the center. Now I want to fill that masked area with a contrasting layer/color. I go back to my Layers menu and add another texture layer, then come back to the Mask menu to mask it. I choose the same Mask option, and then invert the mask using the toggle in the upper left corner. This gives me the exact opposite in terms of mask – the new layer shows in that center area, but is masked around the edge. Since I used the preset positioning, the two masks line up perfectly. An easy way to add another layer with an exactly inverted mask is to duplicate the original masked layer, and then invert the mask. From there, you can go to the Layers menu and choose a new texture/gradient/etc. for the new layer. You can continue to add or duplicate multiple layers with and without masks, but in this case I’m going to save the image from Stackables for the next step in the edit. The “window” in the sky looks kind of empty, doesn’t it? It needs something. I use Alien Sky to add a moon and subtle stars. If you want to learn more about Image Blender masking and the many other functions in that app, it’s covered in-depth in my book, Art with an iPhone: A Photographer’s Guide to Creating Altered Realities. The last step is, of course, naming the image. Sometimes a name comes to me along the way, and other times I have to explore options. The first name that came to me was “Portal” but that seemed too obvious. I looked at it for a while longer and realized the trees were almost like guardians, and so “Gatekeeper” came along. That was it! This image is definitely a recent fav and was a direct result of my #30edits exploration. I love learning something new. I hope you do too! As my #30edits project continues, I’m getting more experimental! 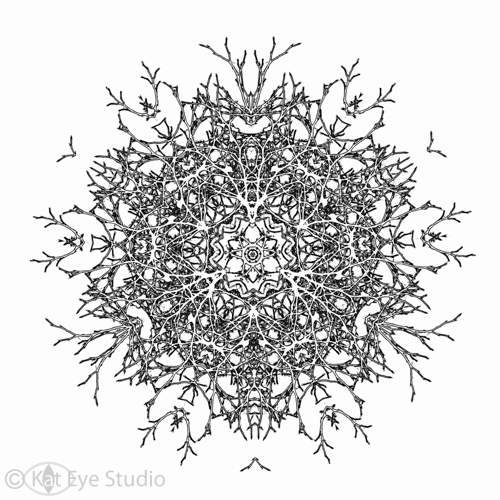 Last week I was inspired to create a tree mandala as a coloring page, since adult coloring books are all the rage these days. 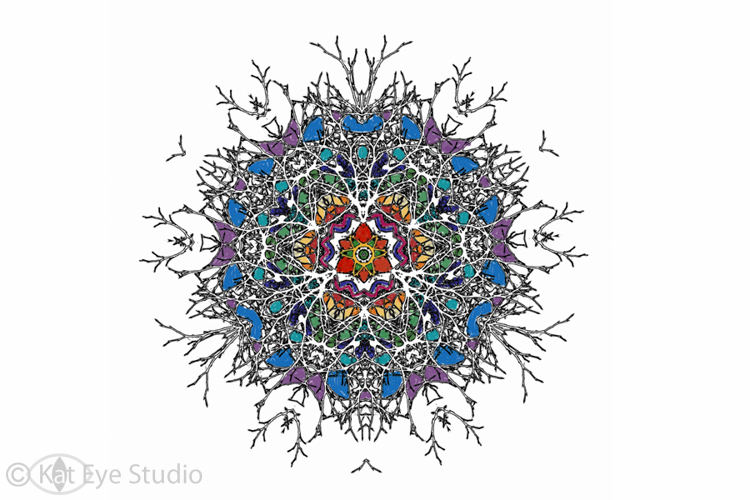 I created the mandala first and then colored it with an app called Art Set, which allows you to color and paint digitally on a photograph. I am making the blank version available for you to download here. You can either print and color on paper, or import into a coloring app like Art Set or Procreate to color digitally. Either way it’s good fun! 1. 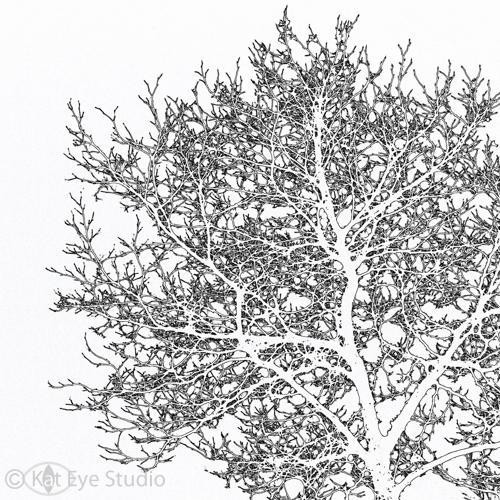 Create a high contrast black and white image of your photograph. Snapseed is a great place to start, using the Black and White filter. You might need to run it through the Black and White filter more than once to get the strong black/white contrast you need for this process. Easier than you thought, huh? Have fun coloring!